The Brown-headed Cowbird is the only brood parasite common across North America. A female cowbird makes no nest of her own, but instead lays her eggs in the nests of other bird species, who then raise the young cowbirds. The Brown-headed Cowbird lays eggs in the nests of many different species of birds. 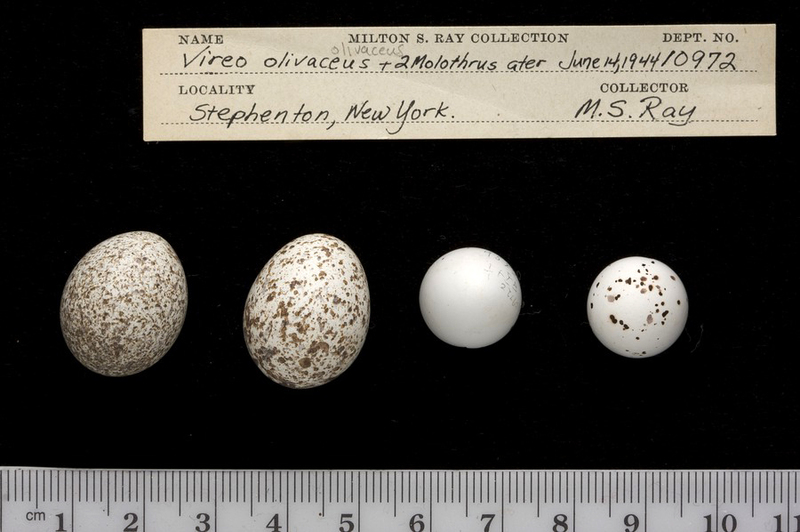 Recent genetic analyses have shown that some female cowbirds will use a number of different hosts, but most females specialize on one particular host species. Social relationships are difficult to figure out in birds that do not build nests, but male and female Brown-headed Cowbirds are not monogamous. Genetic analyses show that males and females have several different mates within a single season. Male shiny black with brown head and neck. Wings rather long and pointed. Male shiny black with brown head and neck, female plain gray-brown. Body, wings, and tail shiny black. Head, nape, and chest dull dark brown. Bill black. Legs black. Entirely grayish brown. Chest with dull streaks. Throat whitish. Suggestion of faint pale eyestripe. Bill gray. Juvenile similar to female, but more distinctly streaked below. Males molting in fall may be patched black and brown. Breeds in areas with grassland and low or scattered trees, such as woodland edges, brushy thickets, fields, prairies, pastures, orchards, and residential areas. Forages on ground, often in association with cows or horses. Outside of breeding season, forages in large flocks with other blackbirds. 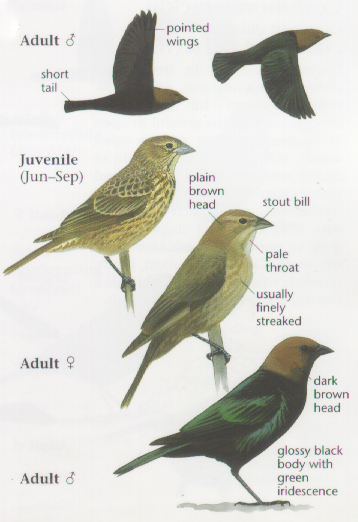 Bronzed Cowbird is larger, has longer bill, larger head, shorter tail, and red eyes. Male lacks brown hood. Shiny Cowbird male is entirely glossy black, but female is extremely similar to female Brown-headed Cowbird, except bill is slightly longer. Brewer's Blackbird female darker brown, has dark around the eyes, and has a thinner, more pointed bill. Female and juvenile Brown-headed Cowbird resemble sparrows, but are larger, completely dull gray-brown, and have unstreaked backs. Song a pair of low "glug, glug" notes followed by slurred whistles ending on a very high pitch. Calls include a chatter and a whistled "fee-bee." Lowther, P. E. 1993. Brown-headed Cowbird (Molothrus ater). In The Birds of North America, No. 47 (A. Poole, and F. Gill, eds.). The Academy of Natural Sciences, Philadelphia, PA, and The American Ornithologists' Union, Washington, D.C.
Woolfenden, B. E., Gibbs, H. L., and Sealy, S. G. 2002. High opportunity for sexual selection in both sexes of an obligate brood parasitic bird, the brown headed cowbird (Molothrus ater). Behavioral Ecology and Sociobiology 52: 417 425. Woolfenden, B. E., Gibbs, H. L, Sealy, S. G, and McMaster, D. G. 2003. Host use and fecundity of individual female brown-headed cowbirds. Animal Behaviour 66: 95-106.